Mercedes-Benz unveiled its 2019 Sprinter van at a port warehouse in Duisburg, Germany, on Tuesday showing off a commercial vehicle that is more efficient, better connected and safer. The van is critical to the automaker’s efforts to capture a bigger slice of the work and cargo van market by offering a vehicle better designed for the e-commerce boom. Various versions of the new Sprinter also will satisfy increasingly stringent fuel economy and emissions regulations globally, especially in urban city centers. Although the Sprinter is popular for recreational and surf van conversions, it is primarily a work tool. About 80 percent of buyers in the U.S. use the Sprinter “to make money,” said Robert Veit, managing director for Mercedes-Benz Vans USA. 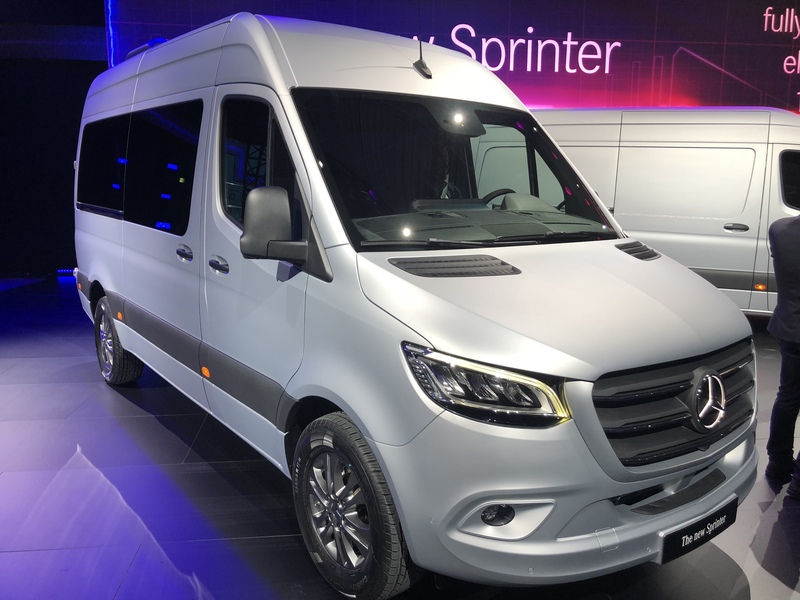 The 2019 Sprinter is the third generation since its debut as the company’s flagship van in 1995. Mercedes has sold more than 3.4 million globally, including a record 200,500 Sprinters in 130 markets last year. The previous generation Sprinter van it replaces has sold since 2006. A key change for North America is the introduction of a gasoline engine option. The current version only comes equipped with a diesel engine. The gas version comes with a four-cylinder engine, and the diesel will have four- and six-cylinder options. “That will allow Mercedes to drop the price and make it more competitive,” said Dave Sullivan, manager of product analysis for the AutoPacific consulting firm. The current model starts at about $34,000, considerably higher than the Ford Transit and Ram ProMaster, vehicles that lead the Euro-style cargo van market in the U.S. Veit said the new gas engine Sprinters will sell for less than equivalent diesel versions. The price difference could be as much as $3,000 to $4,000, Sullivan said. That should help Mercedes grab sales from the Transit, which was the only gasoline offering in the field, he said. Transit leads the segment with sales of 127,360 vans last year. Ram ProMaster was second at 40,483. Mercedes sold about 26,000 Sprinters in the U.S. last year. The option opens up sales to fleets in the U.S. that only run gasoline vehicles, Veit said. “I think Sprinter can move to number two in the segment now,” Sullivan said. The European version of the Sprinter will have both diesel and electric powertrain options. The electric version will be offered eventually in the U.S., said Volker Mornhinweg, head of Mercedes-Benz Vans. But the timing hasn’t been determined. It goes on sale next year in a European market increasingly focused on slashing noise, pollution and carbon emissions in large cities. At this point, Mercedes plans for the new van to have a 41.4 kilowatt-hour battery pack and a range of about 100 miles. The exact specifications could change by the time the vehicle comes to market. Globally, the Sprinter will come in front-wheel-, rear-wheel- and four-wheel-drive. Only the rear-wheel-drive and the 4×4 will be offered in the U.S. The new Sprinter will have configurations that work for nearly every commercial van use as well as serve as a recreational vehicle platform. It will come as a regular cab — the most popular body for a delivery van — and as a crew cab. There will be four different body lengths and three roof heights. There will be a traditional panel cargo van and passenger versions with different window configurations. Mercedes will sell it with right- or left-hand-drive depending on the region. But the automaker is keeping the dimensions of the cargo space the same. That’s seen as a plus for all the so-called upfitters – third parties that customize the vans for specific types of businesses and uses. The new vehicle will require only minimal changes in engineering specifications, keeping the cost of modifications in check. Some versions will be equipped for grocery and prepared food delivery with different climate zones in the cargo area. One extended body configuration will provide seating for up to 20 passengers. The company is building in connectivity for ride-sharing, car-pooling and deliveries. The new van gets autonomous safety features such as adaptive cruise control and automatic emergency braking that have become standard in Mercedes passenger cars and SUVs. It is the first vehicle from Mercedes-Benz Vans to use the automaker’s “adVANce” philosophy of commercial vehicle design and architecture. It builds in digital connectivity hardware throughout the van so that it becomes part of the internet of things. Mercedes believes this will allow the van to be tailored to new, customer-specific applications. “It needs to be a node in the internet of things,” Mornhinweg said. Although Mercedes displayed the vehicle Tuesday, U.S. deliveries will begin closer to the end of this year. 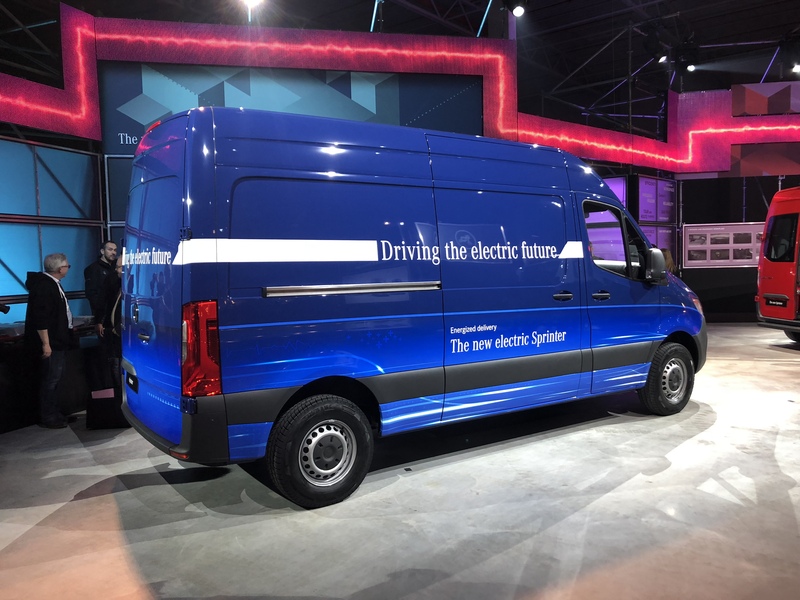 European deliveries of the electric Sprinter van will begin in 2019. The automaker is planning two initiatives that could help grow U.S. sales volume. Much of what will be sold in the U.S. will come out of a new factory Mercedes corporate parent Daimler is building in North Charleston, S.C. that opens this summer. LED high performance head lamps. Sprinter vans are now built in Germany. However, due to an old tariff known as the chicken tax, Mercedes removes the drivetrain and other mechanical components from the strictly cargo versions before shipping them to Ladson, S.C., for reassembly. Otherwise, the cargo vans would be slapped with the 25 percent tariff. Sales of some models of the van, such as the 4×4 version, are constrained in the U.S. because Mercedes doesn’t have enough factory and supplier capacity. The new factory is expected to ease manufacturing bottlenecks. Veit believes that part of the van market is looking for American built vehicles. The new plant will satisfy that requirement, he said. Veit also said there’s room to expand sales through the company’s Freightliner commercial truck channel. Sprinters are sold at 289 dealerships in the U.S. but just 42 are Freightliner stores. Some government agency and trades people such as plumbers and electricians are reluctant to purchase Mercedes-badged Sprinter vans because they believe the luxury nameplate doesn’t present a thrifty image to tax payers and clients. Building up the Freightliner dealer network is a way around those objections. The Mercedes and Freightliner versions of the van are nearly identical. Euro-style vans such as the new Sprinter and rivals such as the Transit and ProMaster have become popular work tools in the U.S., said Stephanie Brinley, an analyst with IIHS Markit. “The design works and is more expedient from a global perspective,” Brinley said. But Brinley doesn’t think Mercedes has much room to grow sales in the U.S. They are seen as an expensive alternative to other competent vans, she said. “We see a bump in 2018, but after that there isn’t a lot more support,” Brinley said. What will the price of an eSprinter be in Europe? Will Mercedes offer a scalable battery – say 300 mile range? I’m looking forward to the 2021 U.S. built 170″ High Roof 4×4 with gas engine as a replacement for my 2015 diesel Sprinter. 2021? I’m hoping that exact configuration is available later this year. What I would like is to have a level 4 autonomous van, with option to upgrade to level 5 when available. Whoever gets there first gets my money. The regular gas model is preferred if it has enough horsepower. It might take a 6 cylinder to make it work better loaded, or a turbocharged 4 cylinder may work too. Let me know when you might have this available. I like the idea of a gas model int he US, but it’d have to be a 6 cyl. A 4 cyl wouldn’t last long hauling this kind of weight around day after day. Adding a turbo may solve the power problem, but it only exacerbates the durability problem. I recently read about a new inline 6 cyl developed by MB that would be perfect for the Sprinter. In tests, it returned near diesel fuel economy according to the article I read. That said, this was clearly a cost decision for MB. That’s why they’re going with a 4 cyl. I’d never buy it, but it’s geared toward cargo/workman fleets, not RV upfitting which is what I’m planning to do with my eventual Sprinter van. Given the 3 choice coming to the US, I’ll have to stick with the 6 cyl diesel, simply due to the heavy weight of an RV conversion.